Some of the greatest beer minds in the country gathered at the Wynkoop Mercantile Room on Saturday for the National Finals of the 2012 Beerdrinker of the Year competition. 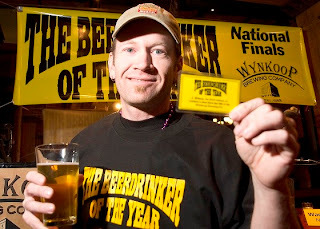 I had the honor of being a judge (for the third straight year) along with outgoing champion Phil Farrell, Wynkoop head brewer Andy Brown, Jill Redding – Editor-in-Chief at the Brewer’s Association, and the first person to ever win the competition - 1997 Beerdrinker of the Year Jack McDougall. After two hours of questioning, presentations, and being asked to identify three different blind beer samples, J. Wilson a Prescott, Iowa writer, homebrewer, beer judge and beer blogger took home the top honors. J. Wilson edged out Greg Nowatzki of Las Vegas, Nevada and Warren Monteiro of New York city. All three finalists proved that they were more than worthy to be on the national stage with their deep knowledge of all things related to beer. J. used a combination of wit, knowledge, and passion along with his keen sensory perception to sway the judges. He also kept the packed Mercantile room crowd thoroughly entertained throughout the event. The judges were impressed with his advocacy and outreach efforts relating to beer and his drive to educate others about the drink we all love so much. His philosophy is to create a balance in life between friends, family, work and his appreciation for beer – to promote responsible beer drinking. 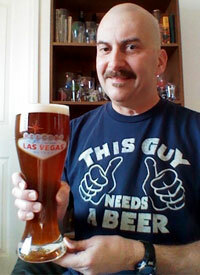 He is one of those people that you want to sit down and have a beer with – and that is what the event is all about. 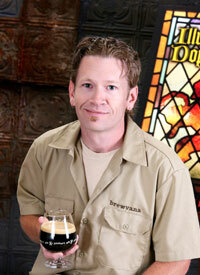 J. had numerous beer related accomplishments in 2011, which helped get him to the finals, but the most impressive was his 46-day fast living on nothing more than water and a Doppelbock he brewed with a local brewery. The Doppelbock style originated with the Paulaner monks in Munich who would brew the strong, nutrient-rich beer to sustain them while fasting during lent. The Bockbier of that time had a similar original gravity, but was far less attenuated, leaving more residual sugar and less alcohol. This is a story known by many beer lovers, but I’ve never known anyone to actually give it a shot. J. is not a big guy, weighing in at 154 pounds during Saturday’s competition. In order to prepare for the experiment, he put on 20 pounds before the fast. Over the next month-and-a-half he would drink between four and a half and five beers per day. (This diet takes a very understanding boss!) He said after a few days his body “shifted” and got used to the new diet without any major issues or hunger. He did, however, loose 26.5 pounds during that time. His blogging and notes became a book that he published last year titled “Diary of a Part-Time Monk.” If you want to learn more about his experiences I recommend surfing over to Amazon and purchasing the book. He gifted each of the judges one during the “bribe” segment of the competition, and I’m looking forward to diving into it. As the winner J. will receive, among other things, $250 to spend at his home pub (El Bait Shop, Des Moines, Iowa), a beer brewed in his honor by the Wynkoop for next year’s competition, free beer for life at the Wynkoop Brewery, and worldwide recognition. It is always tough to not win, but Warren and Greg should be very proud of their performances. I am sure both will be back in the finals in the future. Finally, I want to thank those of you that came downtown to take part in the event. I know I had a great time, as always, and I hope you all did also!